One of the main reasons for the effectiveness of Tai Chi is that it can be used by people recovering from injuries or people with chronic medical conditions such as arthritis and heart conditions. Why does Tai Chi work for weight loss? Non-competitive. Even two-person exercises like "push hands" are cooperative and fun. Focused on inner strength instead of muscle strength. Meditative in nature, which improves focus, balance, flexibility and concentration. A stress-buster, clinically shown to reduce anxiety and depression (often causes of psychosomatic pain), and boost confidence. Great for reducing stiffness and pain by improving flexibility. Because many people suffer from weight issues that are the result of a medical problem, either chronic pain or injury, Tai Chi is used extensively for treating these patients. These problems create weight issues mostly because of loss of flexibility and/or balance. Tai Chi encourages movement that is relaxing and teaches you how to walk gracefully and with as little energy use as possible. Stand on one leg, arms loose, and feet at shoulder width. Keep the joints loose and relaxed. Slowly shift your weight onto your left leg. The movement should be a slow shifting of your centerline from your anatomical center to the center of your left leg. Raise your right knee to waist level. The knee is bent to 90°. Slowly raise your arms above your head. When your arms reach their apex, slowly bend at your left knee to a mini-squat while, again slowly, lowering your arms to shoulder level. Finally, slowly raise your body, lowering your right foot while raising your arms above your head. In many cases a person's excess weight is concentrated in the legs, hips and stomach, which will cause problems in both flexibility and balance. 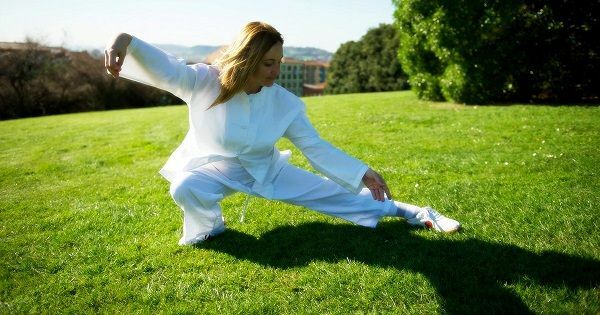 Tai Chi has very few high kicks and most of those are in Chen style, but the Crescent Kick is a very effective exercise for restoring muscle to the legs thereby reducing excess mass. Hold arms at shoulder height, in front of the body, in line with the left shoulder, right arm higher and palms facing to the right. Your extended palms will be your target as you lift your right leg toward your right shoulder, crossing your body in front of your face to, gently, kick your palms and then return your foot to the floor. The kick should have a gentle snap to help the flow of chi and prevent joint injury. The outside kick is simply reversed, with the left hand at the high position and left foot kicking.